If you are a fellow 2011 IPC owner and you want to discuss topics spanning IPC concerns here is a space to do so. I have searched and only saw a thread announcing the debut of this car under the Summitt White color thread and some talk under convertibles but this Limited Production run deserves it own place in the Sun. 50 units shipped to Indy 500 and used as Festival Cars and issued Indiana Plates expiring May 31, 2011 numbering 1 to 50. But some ares were stolen. Of the original 500 units; 153 units were M6 manuals, 347 Automatic Trans. I own the last manual trans. IPC made #153. It was special ordered as a Supercharged LS3 as a joint effort between SLP and Les Stanford Chevrolet in Michigan. It was a ZL585 with a Exterior modification delete. The only exterior mod kept was the ZL Redline rims. This was the first and only Supercharged 2011 IPC built this way and signified as build #001 on the SLP build sheet. This is the same Michigan Dealership, Chevrolet selected to roll out the "Chroma" Camaro at SEMA a few years back. They are the go to dealer when Chevy needs specialty cars done. And they are known for many past SEMA winners. What is the Vin# of your car? Those are the pics I took at the local dealership where his car was sold. Jon has a friend that is friends with the owner of the dealership. 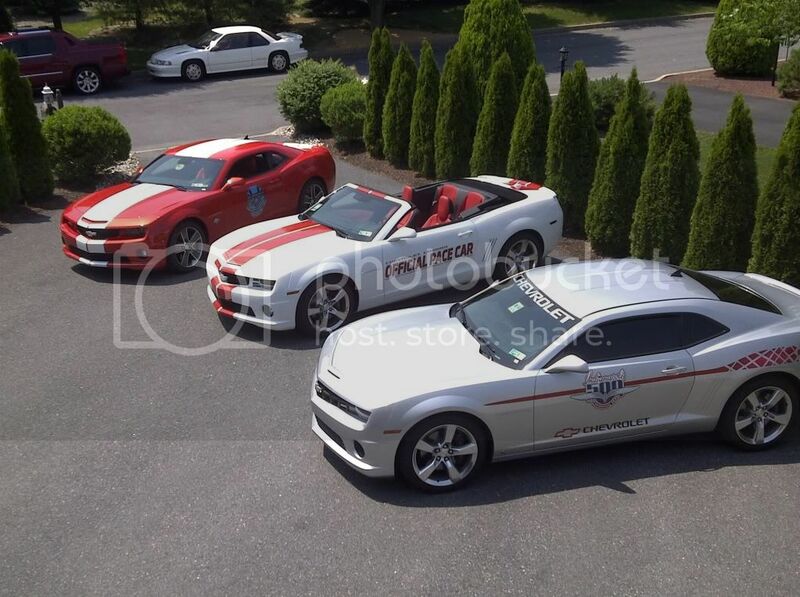 Here is my 6 Speed 2011 Dealer Pace Car along with my 2010 #45 Festival Car and my 2009 #16 Camaro Festival Car. Last edited by autoguy; 12-04-2011 at 03:21 PM. Last edited by autoguy; 12-05-2011 at 09:10 PM. That hardtop was reused at the Brickyard and is now for Sale at Ray Skillman in Indy. I do not want to argue about facts but here are a few things I have learned about the 2011. The winner was awarded car 50. This was decided long before the race. The last of the vin was even 69500. Not all of the Festival cars arrived in Indy at the same time. Festival Cars 1-50 got the dash decal. Car 14-IMS, Car 47,48,49- 500 Festival are 6sds. They are now in C0,KS,IN and IL. The Camaro is smaller on the Festival cars then the real Pace cars. They may have even had up to 4. Of the Festival cars Only car 10 had Izod. It was used in New York and one of the IRL cars. Camaropacecars.com is working on a registry but life gets in the way. It is almost done. The site was also attacked by spam and is working it out. No it's not the fastest moving this time of year but if you follow it in May its a day by day account with cool stuff. Go back and look at the 2011 stuff from the summer. I have not seen any larger then 1/64 at theis time. I am selling my 2011 Indianapolis 500 Pace Car Convertible. It is a completed loaded, 6-Speed Automatic with 1,200 miles. The car is MINT. The VIN# is 2G1FK3DJ4B9191027. This would be the perfect Christmas present. The car is located in New Jersey. For more information contact me at seanpeters8@yahoo.com. Here is my 6 Speed 2011 Dealer Pace Car. I like your Redline tires. What Brand, style and size are they? Nice looking ride. I have over 250 2011 Pace Car Vin numbers and the dealers they were delivered to. If the person starting a registry wants them let me know I would be happy to fax them. Can you email them. I can get them to the proper person. They are custom made Nitto Invo's. 275's in the front and 315's in the rear. Hurst wheels are 9" and 11" wide. I can only fax them, I only have printed hard copies.